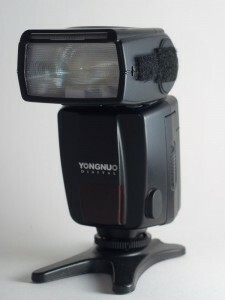 As you can see, this flash has some really great features, all for about 100 bucks. 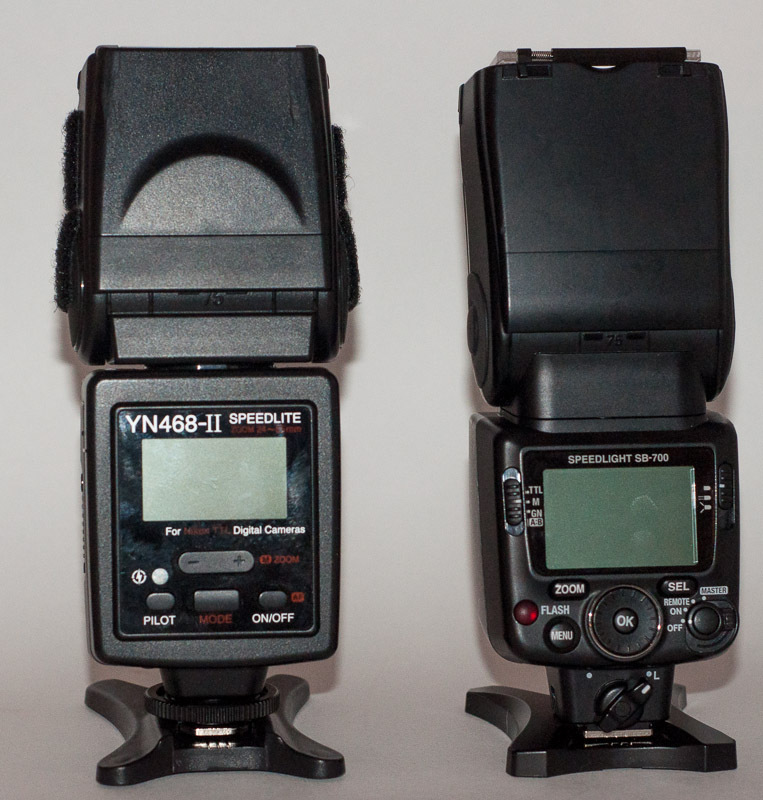 Strobist enthusiasts will love that you can use it in full manual mode down to 1/128. Many flashes at this price point don’t go that low. The guide number is pretty modest, but for general use you shouldn’t have any issues. Upon opening the box for the first time, I was pleasantly surprised that it wasn’t built like a well, 100 dollar flash. Although not as solid as the SB700, it’s about a third of the price, and pretty solid for 100 dollars. I’ve dropped this bad boy a few times without any issues. Lets talk about the most important aspect first, performance. I use NIMH batteries on my flashes, and this was no exception. The first thing I did out of the box was fire it off 4 or 5 times to see how the recycle time was. It clocked in at a little under 2 seconds at full power, pretty impressive. Even more impressive is that it didn’t take longer even when the batteries were almost completely drained. Sweet. I don’t use speedlights on camera all too often, but I started my testing with it on camera. I wanted to test out TTL and see how accurate it was. For the most part, it was very good. There were a few times it over exposed my shots, but I didn’t see it under expose at all. It communicated perfectly with my D90. Manual mode worked as you’d expect, no issues there either. I tested it straight at my subject, as well as bouncing a few shots off of the ceiling too. My real test would be how it performs off camera…. The included flash stand, very handy. I wish it came with a Sto-Fen like diffuser, but at this price, it’s hard to complain. The 468II comes with 2 optical slave modes, and it’s a little confusing. S1 mode uses the main flash of the master flash while S2 uses the “pre flash” to trigger. I always use S2 mode and to be honest, I’ve never noticed a difference between either mode. Both modes work flawlessly, even when not completely in line of sight. I’ve had many times where I’m using the 468II as my background light, blasting a backdrop with a gel on it that is hidden behind a chair or beanbag or whatever. it’s pretty rare that it doesn’t fire. 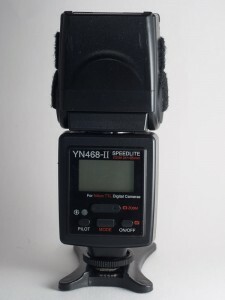 I use this flash almost every day, and it is almost as reliable as the SB700. I say almost because the 700 is freakish on how well it can see another flash. As stated above, the recycle time is pretty awesome. it’s right around 2 seconds at full power with NIMH batteries. I haven’t tested it with alkaline batteries, but my guess is that it is probably much slower. I don’t have exact numbers on how many pops I get before the batteries die, but it hasn’t been an issue, I have yet to wonder why the batteries are dying so quickly….now lets move on to some of the things I’d like to see added/improved. As you can tell, I’m loving this flash. For 100 bucks, there aren’t many things to complain about. The first would probably be a little more power. Although it has decent general use power, it could stand to gain some more. I don’t know what the cost is to amp up the power in speedlights, but I can’t imagine it’s all that expensive. I’d also like to see the zoom pushed out to the 105mm range. I don’t use TTL often, but it would be nice to have that feature available off camera if I ever wanted to use it. The biggest thing I’d like to see is High Speed Sync, but at this price point, it’s just not going to happen. In fact, there aren’t many non-Nikon flashes that support HSS, and the ones that do are out of this price point. That’s about it. The only other thing to add is the size. I’ve added an image at the bottom of a comparison with the SB700. The 700 is definitely heavier, but size wise they are comparable. I haven’t seen many reviews of this flash, and that is a shame, as it’s a very good flash, and outstanding for the price. If you are looking to break into off camera flash photography, there aren’t many better flashes. I was very skeptical of this flash before I got it, as I didn’t know the brand at all. Yongnuo offers a bunch of different speedlights, so check out their store on eBay, you won’t be disappointed. As you can see, the SB700 and the YN-468 II are pretty comparablein size. The SB700 is definitely heavier though. Note: The 468II doesn’t come with velcro on the sides, I added that to hold my gels. 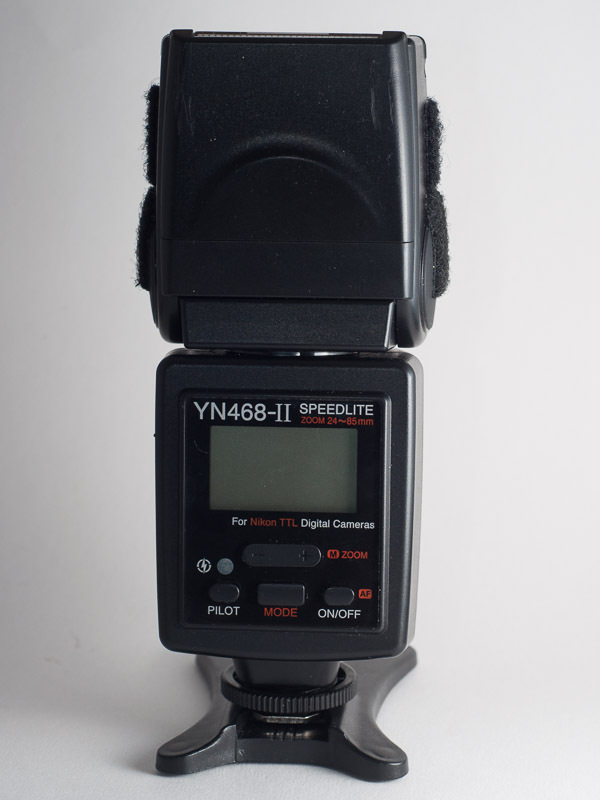 Hi, is there any way to silence the audible alerts when the YN 486-II is zooming? The over exposure has to do with the fact you were using matrix, rather than spot or center metering. Ahhh, that makes sense, I should use spot metering more.